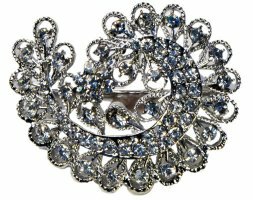 Crescent Bouquet Buckle ​Rhinestone buckle embellishment can be used as an accent to bouquets, boutonnieres, corsages, or to add a little something extra to a hairstyle. Other uses include napkin rings and decorating vases. Whether it is pearls or diamonds, the unique elegant look of a buckle adds a new dimension to your design and adds a great keepsake for the bride to keep forever and maybe even pass on from one generation to t​he next. Beautiful rhinestone accents are great for brides and bridesmaid bouquets. The Ribbon Diva offers a large selection Crystal & Pearls Wedding Bouquet adornments help enhance the Brides beautiful bouquet or embellish invitations.